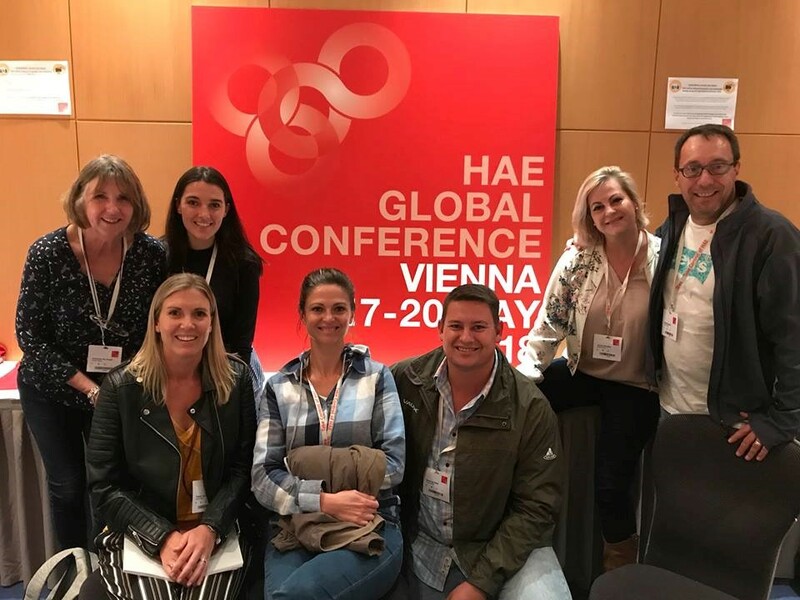 We have just attended the world HAEi conference in Vienna which is run by the most amazing and dedicated people. The president, the executive and research cohort are all HAE patients and a vast number of them are doctors and researchers. The theme of this conference was take control of your HAE and was aimed at patients themselves. There were 736 patients in attendance from 57 countries. South Africa was represented by 7 people. Acute attacks are treated with Fresh Frozen plasma, but it is not ideal due to delays and needing to match blood types, and it is slow to act. The conference was run on 3 tracks, a patient track, a Youth track and a Scientific track so as to encompass all aspects. It is so uplifting for patients to see that it is possible to fulfil high flying rewarding careers despite suffering from this limiting and debilitating disease. The only reason for this amazing success story, is the fact that this dedicated group has pioneered for themselves, the development of ground breaking modern medicine. This is where we in South Africa and in some other parts of the world have a problem, in that these medications are not registered. This means that life-saving drugs that are needed are simply not available. We as a patient group have a duty to push for the availability of these. It is surely the right of these patients to get access to drugs that will never be mainstream but are vital for them just to stay alive. I first initiated a patient group in the middle of 2016 after years of frustration in watching the slow progress and of never being able to ever meet anyone else with the same condition. The very first time that I had ever met another person with HAE was in May 2017 when I joined a walk on the Camino de Santiago in Spain, organised by HAEi prior to their conference in Budapest. It was a revelation to see such a bunch of normal and high achievers –all with HAE! At our initial get together in Cape Town in October last year 31 of our 71 South African patients were able to attend, which was really impressive. This was attended by HAEi President Tony Castaldo from the USA and Henrik Balle-Boysen Executive Director from Denmark as well as UCT Professors Jonny Peter, Mike Levin and Prof Emeritus Paul Potter who were the co-hosts. Nevertheless, at that meeting 6 of those 31 patients had experienced deaths in their immediate families (their parents or children). This is a shocking statistic from a patient perspective. And there is information about HAE on the AFSA website. www.allergyfoundation.co.za, for a list of medical professionals that treat HAE. A lovely commentary. .Well done Adrienne!